Use this Non-Penetrating Roof Mount Base to safety and securely install dish antennas on flat roofs where drilling holes isn't an option. The heavy-duty steel base consists of (6) pieces of equal length which can be assembled from 35.5" x 35.5" up to 36" x 36" for a wide-set, sturdy base - the perfect size for the concrete blocks needed for ballast (not included). Additionally, the (4) struts of the unit are 22.5" in length. Once placed and weighed down, simply add a mast (sold separately), and attach your antenna/dish of choice. 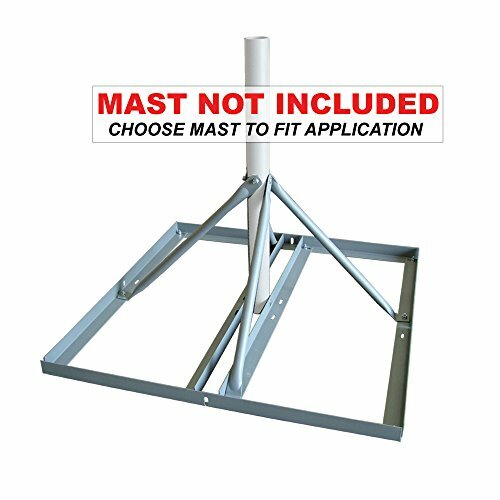 See our selection of compatible masts: SKY32817A, SKY32817B, SKY32817C, and SKY32817D.